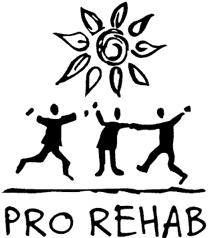 Pro Rehab is the exclusive provider of therapy services to Elim Care. For nearly two decades, Pro Rehab has worked to develop an expertise in providing therapy services within skilled nursing facilities and care centers. Through the efforts of Pro Rehab’s dedicated therapists, many senior adults have been able to return home following a health issue. In addition to the therapy services provided within skilled nursing facilities, Pro Rehab also provides home health services and has two outpatient clinics. Evaluates and treats individuals whose everyday physical activities have been disrupted by disease or injury. Physical Therapists treat clients of all ages with several types of disabilities. These disabilities could result from back and neck pain, arthritis, bone fractures, degenerative diseases, neurological disease, cardiac disease, injury, or developmental disabilities. Neuromuscular/musculoskeletal disease or injury can be treated with a variety of physical means. Provides evaluation and treatment of deficits in ability to perform daily living skills such as feeding, dressing, bathing, cooking, or participating in leisure activities. OT promotes independence and safety, and minimizes the functional effects of disabilities. Evaluates and treats a wide range of speech and swallowing disorders. SLP’s help people develop effective communication skills. Our philosophy reflects the belief that each individual is a unique and important person. We help to promote the dignity and self-worth of each person in a safe, friendly, and progressive manner. Our mission is to provide the finest and most cost-effective therapy services to those we serve. To accomplish these goals, we combine knowledgeable programming with outstanding patient care.